Yay -- WinADay Casino has just launched another one-of-a-kind game. 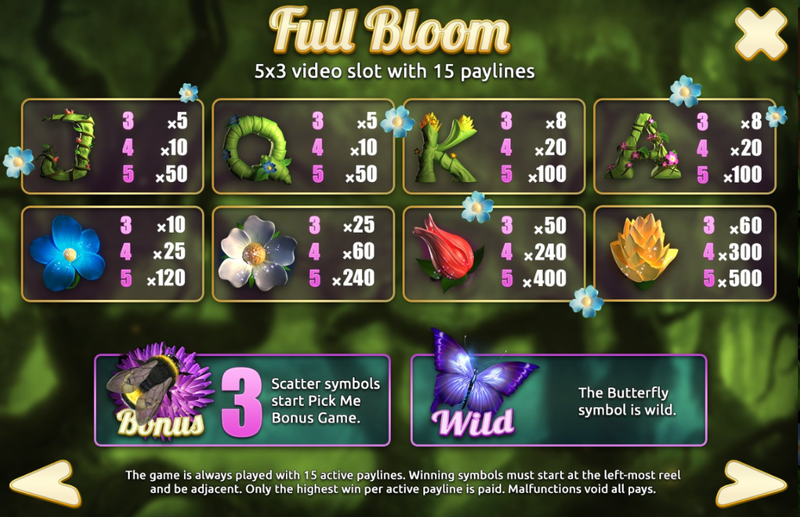 The new Full Bloom is a floral-fantasy themed game with quite a low betting range -- perfect for when you're trying to stretch your slots budget. This is WinADay we're talking about so yes, of course there's a freebie for us to try it out with! Until this Friday, May 15, the unique casino is giving players an $18 freebie and giving 150% bonuses on deposits. "There's nothing I love more than a new game,” said one player, “Nothing more than a freebie to try a new game, that is! " You can bet from $.30 to $6 per spin on Full Bloom. Like Stardust, the last new game at WinADay, Full Bloom simplifies betting by giving just five bet choices. 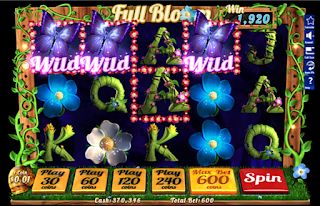 It has a pick-me bonus game triggered by Honey Bee scatter symbols where you pick flowers to reveal prizes – which can be thousands of bonus coins. 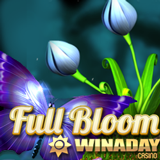 Full Bloom at WinADay Casino has a low betting range but big prizes in the bonus game. You don't choose how many lines to play in Full Bloom. You always play with all 15 pay lines active and to vary your bet you simply choose whether to wager 30, 60, 120, 240 or a max bet of 600 coins. With a max bet of only $6 you can have lots of fun for pennies a spin. However, the bonus game pays up to 5000 coins so payouts can be bloomin' big! "There are lots of players that prefer to play more elaborate premium games with a higher betting range, bigger max bet, and bigger payouts like our site-wide progressive jackpot. They like premium games like Castle Siege and Gypsy Charm, “observed WinADay manager Michael Hilary. "But there are also lots of players that have more fun betting less, so we also have games like Full Bloom for them. " WinADay Casino has been enjoyed by players all over the world for nearly 7 years. With this new game the unique casino now has 58 one-of-a-kind real money online slot games: 32 premium slots, 16 penny slots, 6 video poker games, Keno and Roulette.